For me, Burning Man has never been about epiphaneous moments or breakthroughs. It hasn’t helped me gain a new understanding of human diversity or my own potential. It’s hasn’t helped me discover the real me nor has it changed my appreciation for my everyday life. What it has been, however, is the best week of my year for the past four years (and five of the past six). This year has been about a different kind of adventure for K and I, one filled with joy and fear and hard work and community. A bit like a Burn, but not really. Despite being immersed in and overjoyed by this experience I couldn’t help but feel some wistfulness for the playa during the first week of September. I missed the smell of the dust. I missed the intense three days work building our camp, More Carrot: The Black Rock City Farmers Market. I missed coming together with friends old and new in Reno and the anticipation of the night before we hit the playa. I missed the art and the noise and the kaleidoscopic variety of people and outfits and moments. It was impossible not to remember moments from Burns past. Of minarets at dusk and the trash fence at dawn, of PBR for breakfast and sushi feasts offered by new friends, bike obstacle courses and pop-up Chinese restaurants, of our wedding in 2008 and of watching a memorial service while on duty as a Temple Guardian last year. So many amazing, moving, inspiring, hilarious times. And I realised what it was I missed most: The uniquely immersive immediacy of Burning Man. When I’m at Burning Man I feel so present with my surroundings I forget I’m present with my surroundings. I forget for long stretches of time that there is anything else I could be thinking of. I think creatively, I imagine, I sketch out future projects, but I don’t worry about my to do list or about money or question my relationships or stress about politics. I’m just wherever I am, engaging with the person I’m there with. In my everyday life I’m seemingly-unavoidably scheduled. I have days I’m working from home and days I’m in the city, daily meetings in person or on skype or by phone. I’m engaged in a constant battle to keep my inbox close to zero and I’m throwing presentations together in the hours before I give them. At Burning Man I feel almost completely unscheduled. This despite being part of a theme camp with shared meals and shifts to be done on the market and despite the other volunteer stuff I always do, whether delivering the Black Rock Gazette newspaper or serving as a Temple Guardian. Beyond these specific experiences which I play just enough attention to what time it is to turn up to I plan almost nothing. Maybe one musical act on a particular night. But mostly I don’t chase bands around the playa, I don’t organise to meet people at particular times or places, I don’t target specific events or workshops. The last three years I haven’t actually looked in the What|Where|When events guide at all. Not once. Instead I go where the mood takes me with the people I happen to be with, mostly my closest friends but sometimes delightful new people. Sometimes we decide to open a pop-up restaurant, sometimes we play cricket, sometimes we go looking for art, sometimes we go to the steam bath, or a cocktail bar, or to visit friends. It’s wherever the mood takes us and it’s always the perfect place, close-enough. I never feel like I’m missing out on anything because where I am is always spectacular. This immediacy brings a real freedom to it, a sense of being in flow, at one with space and time. It’s a rare feeling, something you also feel when you’re falling head-over-heels in love, during the birth of a child or in the midst of creative production. I’d like to try to create more of this in my everyday life but it’s so much harder here. These meetings (mostly) need to happen. I love collaborating with people and making things happen and that means deadlines and meetings and to do lists. And without these structures and habits and commitments I really can’t get much done, and there’s a lot I want to do. This busyness stems from my purpose and my passions and I wouldn’t have it any other way. The key, I think, is balance. I couldn’t live Burning Man year-around. As glorious as it is there’s so much else I want to experience in my life and a satisfaction and meaning that can only be gained through hard work and sticking with something. Bringing immediately into everyday life doesn’t require giving up meetings or to do lists but rather cultivating time for reflection and to connect with others in open and creative ways. Bodhi helps me be more immediate (although also makes me more scheduled), as does time outdoors, catching up with friends, going to festivals and riding my bike. I want to live with the spirit of Burning Man year-round, embracing immediately and generosity and shared experiences, even as I commit to the hard work of making difficult things happen. So, balance. An hour a day. A day a week. A week a year. Time without pre-established priorities, restrictions or responsibilities, without a to-do list guiding your actions or an event I’m preparing for. Unstructured time for thinking, playing, feeling, being. Missing Burning Man this year has also given me more perspective on the big questions of whether and when to take Bodhi to the burn. Since we knew Bodhi was coming we have been discussing this. I’ve vacillated between thinking it would be great fun to take him when he’s young and to see him experience such a fantasy land through the eyes of childhood and thinking that it would be more fun not to take him and to use it as a week off (every two years, say) from the priorities and responsibilities and constraints of parenthood. Missing this year’s Burn has made me realise more strongly than before how much I value the unstructuredness (somewhat: I still help organise a theme camp so compared to how unstructured your burn could be it’s pretty structured, but compared to how structured my life usually is it’s very unstructured) and openness of Burning Man and the immediacy I experience there. It also made me feel the loss of the balance Burning Man has provided over the past four years, the way it has inspired and recharged me, the new ideas and, new friendships and new insights into myself I would come back from my week in the desert with. All of which makes me lean towards not taking Bodhi, for a while at least, and using it as a chance to step away and recharge every couple of years. I’d love to take Bodhi when he’s a bit older, when I trust him to look after himself sufficiently in the conditions and socially, but the stresses and pressures of taking a baby/toddler/tiny child to Burning Man would, I think, restrict much of what I most value about the experience. For now at least. How do you create unstructured time in your life? As I wrote recently, Burning Man is Festival 2.0. It is a user-generated community, built on the respect and responsibility of its citizens, a place where people are participants, not consumers. The event and indeed the entire culture is based on ten principles, one of which is "leaving no trace". This practice of leaving no trace creates a radically different consciousness than you see at other festivals. There is little-to-no trash anywhere on the ground as the community takes responsibility not only for our own trash but for each-others, picking up any pieces of MOOP (Material Out Of Place) we see. Camps build evaporation ponds to deal with their gray water and ship out all their own food scraps and recycling. Successfully leaving no trace requires more than the right consciousness, it requires intent, in the form of pre-planning, and responsibility in the form of follow-through. This responsibility is most apparent at the camp level. The Black Rock Organization recently published the MOOP Map of Burning Man 2010, seen above. I am pleased to report that our camp, More Carrot, was given a green grade, the best possible, indicating low to no impact trace. Not that this was exceptional: as you can see the vast majority of the city is green, with only scattered patches of orange (moderate impact trace) and red (high impact trace). This is what a community looks like: people taking responsibility for themselves and taking care for each other and their environment. It's one of the things that inspires me to participate in Burning Man. What changed between 2006 to 2007? The MOOP Map was published for the first time . There's a really important lesson in this: accountability resting on transparency made the difference. Despite all the power of the Burning Man culture an unacceptable amount of MOOP remained. Then, suddenly, this culture was reinforced with publically-available information detailing how the different camps and neighourhoods of the city were performing against the Leave No Trace goal. And immediately this public accountability produced a huge leap forward in the trash situation as camps worked harder than ever to avoid an orange or red grade. Transparency reinforced existing community norms both by making deviance from this norm visible and thus additionally unacceptable and signaling to those doing the right thing that their efforts were appreciated. It felt good to see our camp covered in Green when the map was released. It feels good to be part of something that inspires and aggregates individual contributions towards a community goal in this way. The question is how can we create this level of personal responsibility and community consciousness in all our communities? What sort of transparency is required to support this? Burning Man is famously difficult to describe. It is so many different things to so many different people: a huge rave in the desert, a spiritual journey, a temporary community, the world’s biggest sculptural art exhibition, a survivalist gathering, a place to discover new parts of yourself, for grieving and letting go, for exploring, expressing and sharing. It’s hard to summarize all of that for people who haven’t experienced it for themselves, hard to link your individual stories to this larger context, hard, in a way, for even an experienced burner to make sense of it all, the unique jumble of experiences, emotions, observations, visual stimulation and desert living. Every year I’ve gone I’ve aimed to write about my experience but every year I hit this wall and the gap since the festival grows and eventually I give up. But this year, as my camp-mate Elly would say, “I’m doing it!”, very late but sooner than never. What Burning Man is, fundamentally, is festival 2.0. Just as web2.0 is a platform for user-generated content Burning Man is a platform for user-generated experiences. The Burning Man Organization ensures that the very most basic infrastructure exists for the event to take place: roads, medics, port-a-potties and, of course, the Man. But everything else that makes a festival a festival is created and provided by the participants themselves: the music, art, venues, workshops, performances. All of it. Some of the major art works get grants to assist them to create their pieces, but this rarely covers costs and never covers labour. That’s not to say Burning Man doesn’t have bars, restaurants, café’s and food stands. It does. It has not only everything you’d find at any festival (music, art, food) but also the things you’d find in the coolest part of a city: venues, restaurants, art galleries, spa’s, mini golf, roller disco’s. These hundreds of venues, events, parades and happenings across the city are created by autonomous groups of participants and everything they provide is gifted. Just like web2.0 what makes Burning Man tick is generosity. And all of this takes place in one of the harshest places on earth, the Black Rock Desert in Nevada. Truly, it is a miraculous, empowering and inspiring thing. This year K and I and an amazing group of friends from around the world came together to create a first-time Burning Man theme camp: More Carrot. Theme camps are the official interactive zones of the city. To qualify as a theme camp you must have things at your camp for other people to participate in. If selected as an official theme camp you get placement in a prime location in the city (ours was amazing, only a block from Center Camp) and the right to arrive early to set up. You can read more about the our name and formation here. The 25 members of our camp flew in from six countries, convening in Reno where we had rented two houses in which we do the pre-construction for our camp including building the farmers market stall, the bike rack and two giant glowing carrots. There was storage and truck hire to organize. Hundreds of litres of water and hundreds of dollars of fruit and vegetables to pick up and get to the site and, in the case of the perishables, keep fresh for almost a week. In other words: it’s a really significant undertaking. And coordinating all of this from multiple time zones required using all our skills in online collaboration and team-building. Starting in January we invited selected people into a Google Group which was used for brainstorming and getting to know each other. Teams were formed for each project, both infrastructural (transport, power, lounge, etc) and interactive (the Farmers Market, Countless Carrots March, gifts, etc). These teams developed their plans and made budget submissions to our Organizing Committee for approval. Total camp budget was $6,250 ($250 each) but many members of the camp showed generosity that went far beyond this, providing additional elements individually. The Organizing Committee used Basecamp and met fortnightly on Skype (at 2pm SF time, 5pm DC, 11pm London and 7am in Melbourne), moving to weekly for the final six weeks. This level of organization was necessary to manifest our vision in the middle of a desert but also because 17 of the 25 members of our camp where first-time Burners. We invested so much time and effort in More Carrot because those of us who initiated the camp had a goal that was, in a way, bigger than any of our specific events: we wanted to create a camp which was a true community; where everyone was involved, respected and included; where no one was a spectator. Burning Man is a massive platform for individual experience and participation and it was really important to us that More Carrot also reflect the Burning Man principles of community, participation, self-expression and self-reliance. In a way, this was the real project, creating this community, and the specific projects simply means to this end. They were also, of course, a whole lot of fun; a chance to play and interact and contribute to the magic that is Burning Man. And truly, magic things happen at Burning Man, things that could happen nowhere else. My favourite only-at-Burning-Man moment this year occurred on Wednesday. I noticed that two guys appears to be working on some sort of wooden sculpture in our camp’s front yard, right between our two carrots. Intrigued, I wandered up. “Hi”. They looked up: “Hi”. Went back to their work. “What are you guys up to?”. “We’re building an onion.” Said as if this were the most obvious thing in the world. And indeed, now I looked closer, it was an onion, and a bloody good one, created by folding thin slats of wood together. These guys had come to the farmers market on Tuesday and, impressed, promised to be back the next day to build us an onion. No-one took this seriously at the time but here they were, creating an amazing 7-foot tall onion sculpture for our camp. So now instead of simply two carrots we had the beginnings of a veggie garden. What an amazing gift. And then there was my favourite artwork on the playa this year: Ein Hammer! Ein Hammer was a giant metal hammer emerging from the playa surface, capable of throwing fire out from its shaft and head. But it was more than just a great piece of fire art, it was a game! Similar to the iconic carnival strength test where you hit a target with a hammer to see how high you can make the bell go this required three players to strike sensor pads with sledgehammers, with the height of the subsequent flames the result of how in-sync you hit. If you succeed the fire makes it all the way to the top and bursts spectacularly out the head of the hammer as it spins around. And if this wasn't enough it was more than just a great fire art game, it was a fully themed performance piece with a ringleader crying out in a German accent, cheesy 80's music and screens embedded in the desert showing the workers toiling in the furnaces beneath the surface, shoveling coal into a great fire to sustain the hammer. I had a go, it was unreal. Crazy, magical, fun. We tried to do a lot this year, perhaps too much. Bring 17 virgins to their first burn. Run a farmers market. Host two parties and a sock wresting championships at our camp. Organize three roving events including taking on the well-established Billion Bunny March with our own Countless Carrot March. Support a team spread out across the world to work together and get amazing things done. And we did it! There were, of course, mistakes and hiccups. The early-entry crew discovered we were missing poles to erect the kitchen, and had to send people out of the festival to where they could get reception to send a message to the group still in Reno. Our power set-up can be improved and next year we’ll have a bigger kitchen. But this is all so minor compared to what we achieved. We were a part of building the most extraordinary city on earth, fueled by creativity and passion and community. And for carrots, of course. Gotta have your vitamin A, especially in a desert. The response to the market, and to our other events was fantastic, and I’m super-excited to take who we learnt this year and apply it to next year’s camp. Thank you to all my fellow carrots who made this experience so fulfilling and so much fun. Building our camp and our community with you was an amazing experience. I can’t wait to do it all again. Late last night I submitted the theme camp application for the More Carrot camp at this year's Burning Man Festival. I wanted to share the heart of the application, where we are asked to describe our philosophy, goals and interactivity plans. We are an ambitious bunch this year and it was hard to fit all our ideas into the 5,000 characters (including spaces!) allowed.If you like the sound of the below please join our Facebook page. Now it's a waiting game, theme camps will be announced in early May. More Carrot was the name a group from Australia and the UK chose as a label for our projects at BM 08. The name refers to the nature of incentives: you can use a carrot or a stick. We endorse the carrot approach, providing encouragement and rewards for people to do their best. But we also believe strongly in the importance of eating your vegetables in the desert—not always an easy thing! That first year we built a tower, ran 5 EL wire PacMan bikes around and organized a mobile prom. We were part of Deadly Muppet, a crew from San Francisco, who some Carrots had camped with in 04 and 06. Last year More Carrot evolved into an independent camp within the Oasis 47 theme camp village. We built another tower and a hookah lounge with tapestries, cushions, and, of course, hookah. We also hosted strip glow bocce and glow table tennis and ran a Chinese restaurant (“The Dusty Prawn”) out on the playa in a dust storm. We dressed up for the Billion Bunny March (as carrots, naturally) and had a lot of fun. For Burning Man 2010 More Carrot is taking the next step in our evolution: a stand-alone theme camp. More Carrot is a diverse and passionate group of people from 4 countries on 3 continents. We planned our camp around two elements: Our name: More Carrot. And the theme: Metropolis: The Life of Cities. We talked about the kind of city we want to live in, and, specifically, given our name, the food culture of cities. We realized what the Black Rock Metropolis needs: a farmer’s market! Imagine: it’s 7 a.m. and you are wandering home from the outer playa or on your way to an early yoga class and wafting smells of grilling corn on the cob draw you over to a roadside stall bursting with a cornucopia of beautiful produce, including bananas, pineapples, melons, and (of course) carrots! You stroll up to the stall, where you receive juicy slices of chilled fruits and a citrus carrot cocktail, served by friendly people in farmers overalls. Yes, at Burning Man 2010 we will host an early morning farmer’s market. We will source produce from markets in Reno and Sparks the weekend before Burning Man and have designed a cold-storage system which will ensure we have delicious fruit to gift all week. We are motivated by our belief that cities should promote the selling of local produce direct to the public—and that this should be true in our city, Black Rock City. We also know what an amazing gift fresh fruit is on the playa, especially later in the week, and how food facilitates connection and community. The Black Rock Farmers Market will run from 7-9am Tue-Fri, functioning as both our primary gift to the citizens of BRC and as an art project. The early birds running the market will be in character and costume, hamming it up for citizens of BRC. Our camp will be fun, accessible, relaxing and attractive, featuring a striking 20ft neon carrot (affixed to the front of our tower), carrot lanterns and a chill-out lounge in a modest geodesic dome, with rugs and cushions on the floor, flowing fabrics for walls, and DJs playing funky and relaxing music. Alongside will be our games area, featuring glow-in-the-dark bocce and table tennis, complemented by our main art project ping|pong – a large 2D array of 16x16 tricolour LEDs in ping pong balls, creating a 256 pixel array. ping|pong (inspired by the amazing Cubatron art by Mark Lottor) will serve as the score board for the table tennis and a screen for 2- and 4-player games of Pong. When not in use it will display spectacular light patterns. Last year, true to our name, we turned up to the Billion Bunny March dressed as carrots. We were attempting to build a bridge to the bunny community but were instead discriminated against and refused service at the pre-party. This year we will provide an opportunity for carrots such as ourselves to participate in the brand-new Countless Carrots March! Countless Carrots will express the dignity and inherent worth of carrots in the face of hurtful, persistent bunny prejudice. All carrots will be invited to our camp for a pre-party, where we will serve drinks and provide sign-making equipment. Then we’ll head out to meet the bunnies on the playa. Members of More Carrot will also be hosting several absurdist events, including playa cricket, Sock Wrestling championships (complete with announcers, theme tunes and shiny belts to be won), a surreal crew of inefficient road repairers, and back-by-popular demand the roving Dusty Prawn Restaurant, which serves the hungry and thirsty masses out on the playa. Join the More Carrot Facebook page. Watch the video we made of our adventure at Burning Man 2009. As part of our Oasis 47 camp at Burning Man a group of our friends from San Francisco who go by the name Deadly Muppets built the Caveman Caraoke, a caveman-themed, dragon-pulled, karaoke-focused mutant vehicle. A member of the gang just compiled all the statistics and in the interests of future research into the karaoke preferences of Burning Man attendees vis-a-vis the population at large, and what this says about our culture and community (tell me there's not a PhD in that!) I am posting it here. I've been meaning to write up my Burning Man experiences but it's harder to do than it sounds. Meanwhile, let me just update you on my excitement to see Infected Mushroom at Burning Man. And boy was my excitement fulfilled; it was one of the most adrenalating, annihilating, wildly surreal dance music experiences of my life. Infected Mushroom were set left on a stage with a projector screen behind them, two lasers arching overhead and a flamethrower directly in front of us throwing jets of fire thirty feet up as ten thousand people stomped and shook and screamed their passion into the night air. It was dance music at its best, as a return to a more tribal state, a giving of yourself to the ancient human pleasure of pounding the earth with our feet, finding unity in repetitive music and motions. It was madness, glorious madness. Here's the video I took. The sound quality is awful but hopefully you get a sense of the setting. Check out the fire at 2:36. So I was thinking last night about how much I wanted to go up to Desiderata Festival in NY State and see Infected Mushroom but also how I probably can't really afford it and how we'd be pushing it to get there in time to catch their Friday night set. And I thought to myself, "I wonder if they're playing any other shows nearby around that time." So I looked up their tour dates for August and, alas, nothing any closer or any more convenient. Then, while I was there, I figured I'd click on "show all tour dates" just for the hell of it. And then I saw it: "Sept 3, Gerlach NV". Holy hell, Infected Mushroom are playing at Burning Man this year! 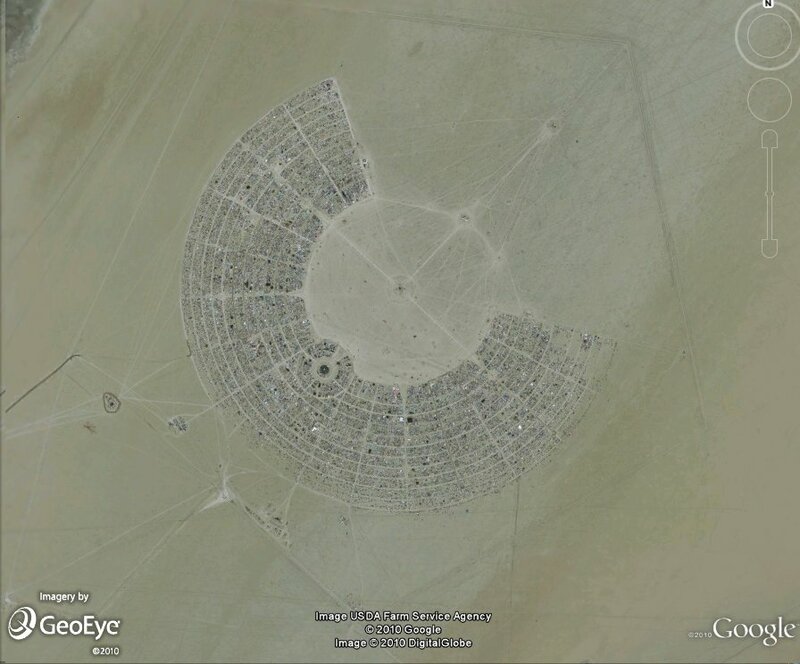 For the uninitiated Gerlach is the tiny town that is the closest civilization to the Black Rock Desert, the site of Burning Man. There's no way IM are playing there, they could only be performing at Burning Man itself. I am, shall we say, quite excited. IM are one of the most innovative and exciting acts on the planet, emerging from the Israeli psytrance scene and now forging new ground as some sort of hybrid psy/rock electronic band.Their new music is an obliterating blend of psytrance, rock, hip hop and, occasionally, classical. IM were the first psytrance act I really got into - their album Classical Mushroom, released in 2000, defined the genre when I first started listening to it. Their subsequent album, BP Empire, contained the first hints of how unique they would become as they started really busting out of psytrance orthodoxy, and being criticized for it by the purists, as such artists always are. The track "Dancing with Kadafi", in particular, brought in ambient and world influences, and remains one of my favourite tracks of all time. Have a listen. If you haven't heard it before you'll be glad you did. Their subsequent albums "Converting Vegetarians", "IM The Supervisor" and "Vicious Delicious" (follow links to listen to tracks) continued a trend towards more rock (and sometimes hip hop) elements and use of percussion, instrumentation and vocals, with their current style and live show being an exhilarating blend of psytrance and metal,always maintaining an extraordinary inventiveness and disregard for music boundaries. I've seen them three times but never outdoors. Never at bloody burning man, with ten thousand of my closest friends, flame throwers accentuating the breakdowns with massive bursts of fire over our heads, the desert stretching away into the darkness behind us, giant ducks with spotlights for eyes and fire for hair watching over us. For those coming to Burning Man: prepare to be infected. This year's event just get's more and more exciting as we approach the home stretch for preparations. I'll have to run down our full plans in a future post, we're all over it this year, I can't wait.